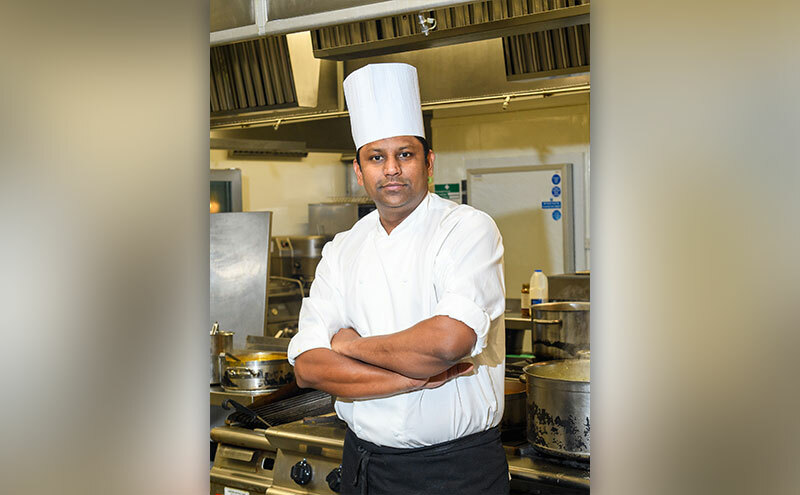 Barath Kumar is the executive head chef at the Radisson Blu on Edinburgh’s Royal Mile in the heart of the city’s old town. Using local Scottish produce, Barath’s kitchen produces a range of hearty and seasonal dishes. I’ve been working in hospitality for 19 years. I graduated in hotel management in 1998 and took up my first job in India as a commis chef. I was fortunate to be selected from over 2000 applicants for a commis chef job in Dubai at the Jumeirah Beach Hotel. I then moved to a chef de partie position within the celebrated Burj Al Arab Jumeirah Dubai. In 2003, I moved to the UK hotel sector and for the past five years I’ve been executive head chef here, at the Radisson Blu Edinburgh. That’s a difficult one. There’s no doubt my big break came with the chance to move to Dubai. I’m also proud to have won a number of culinary awards in both Dubai and the UK, including medals in the prestigious Salon Culinaire and at the Scottish Culinary Championships. Common to many chefs is the challenge of recruitment and retention of high quality personnel in the kitchen. It’s really tough if someone moves on and you need to fill that gap with a similarly committed chef and team player in a busy kitchen. Part of my solution is to aim to keep my team motivated and happy at their work. The other aspect is keeping an eye on the market. Based on the gastro food concept, popular choices like Highland beef stew and our ‘haggis with a twist’ offer diners simple and flavoursome dishes prepared with fresh ingredients, including produce from local markets. I’m proud of my 19 staff (12 chefs and seven kitchen porters). Some are in their forties but the majority are very young and keen to learn. They are very hardworking and creative. Without my team giving 100%, this job is impossible. It’s all about teamwork. Scallops from Orkney and Scottish beef. Simple stir-fry dishes that include chicken or seafood and that pull in fresh, healthy vegetables like broccoli. I like good Scottish cheeses with oatcakes and chutney and if creating a simple but flavoursome dish from Chennai in India, it’s invariably a biryani. I’m not keen on eating or preparing any form of liver and I try to avoid this in my menus. I think it’s something in the taste that doesn’t sit well with my palate. A willingness to work hard and a desire to learn are the key ingredients of a chef. You also have to accept criticism and learn from your mistakes. If you come to a kitchen with this approach, the passion, creativity and consistency will also steadily develop and influence your chefing. Always taste the food before it’s served. Everyday, always cook to the very best of your ability. Experimenting with new recipes leading to different results. There is also plenty of jokes and banter in the kitchen that puts a smile on my face. Gordon Ramsay. From a young age I’ve followed him and he’s inspired my career. He’s so passionate about the dishes he prepares and his whole approach to the chef experience. I’ve been fortunate enough to meet him and he’s a real character. I like to relax with my family, including my seven year old son. My best friend, Prem, is also a chef. For almost 20 years we’ve shared a journey as chefs. He’s currently one of the main restaurant chefs in Harrod’s in London. I think we’d book a table at Gordon Ramsay’s in Chelsea.